Yemen: "We're here with you and we're not going anywhere"
Taiz has seen some of the heaviest fighting in the recent conflict in Yemen. There are airstrikes going on, and constant indiscriminate shellfire, both in and out of the city. The shelling often hits civilian areas and people’s homes, as well as hospitals. There are a lot of snipers, and many areas have been landmined. There isn’t just one risk — there are many. I was based in MSF’s mother and child hospital in Al Houban. My job as a logistician was to make sure that everything was running smoothly, and that the medics could do their work as well as possible. While I was there, there were a number of mass casualty events, so I also had to set up a temporary morgue and put people in body bags. One of the worst moments was on 17 November, when the frontline shifted by as much as two kilometers (one and a quarter mile) and there was a big increase in fighting within the city. At 7:30 p.m we were upstairs in our living quarters above the hospital when we heard reports that a blast had hit a busy market nearby that was crowded with evening shoppers. "It was at this point that we learned that one of our staff, a watchman in our trauma centre, had been killed"
Immediately, we tried to find out if there was ongoing shelling. As soon as we were sure it had stopped, we sent ambulances to the location and alerted both our trauma centre and our mother and child hospital to receive hot cases [the most seriously injured patients]. Then we went downstairs to prepare ourselves as best we could. That evening we had around 30 casualties, both wounded and dead. They arrived in ambulances, in the backs of pick-up trucks, in minibuses, and in little cars. We organised triage, dividing them into green, orange, and red cases, according to the severity of their injuries, and tried to give dignity to those who had been killed. It was at this point that we learned that one of our staff, a watchman in our trauma centre, had been killed. He was brought into the trauma centre and was dead on arrival. That really hit home. It was very tough for the staff to get through that, seeing one of their own colleagues brought in dead. Men walk through the MSF-supported Al Rawdah Hospital on July 24, 2015 in Taiz. With the frontline shifting so quickly, some of our own staff couldn’t get back to their own homes. They had to sleep in the hospital because they had nowhere else to go. MSF works on both sides of the frontline in Taiz, supporting four hospitals inside an enclave besieged by the Houthis and running a trauma centre and the mother and child hospital in the Houthi-controlled area of Al Houban. In the middle of a conflict, people’s day-to-day medical needs can often get overlooked. We are mostly looking after women and children, but we also provide support for all those injured in the war. Our team in the mother and child hospital helps to deliver about 400 babies a month, as well as treating children for malnutrition. Because the health system in Taiz has slowly collapsed, a lot of people have nowhere else to go for medical care. We are one of the few medical facilities still functioning in Taiz. 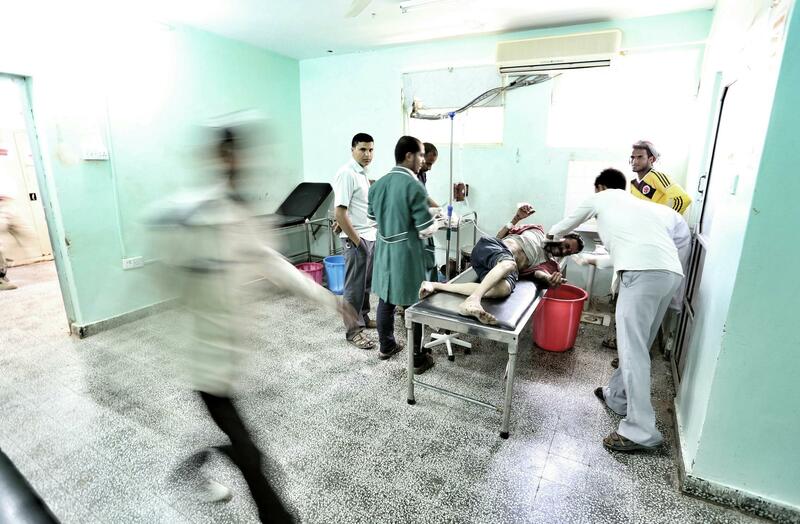 A scene from inside Al Thawrah Hospital in Taiz, Yemen. At the height of the fighting, there was outgoing shelling from near the hospital both day and night. At the same time, there were airstrikes targeting these artillery positions. As hospital staff, it is very scary because you simply don’t know what will happen. You always have to act normal, but in the back of your mind you’re always scared. You don’t know if someone will arrive at the hospital with a weapon; you don’t know if you’ll get hit by a shell or an accidental airstrike. You’re there with the Yemeni staff and the local people, sharing that risk with them. People in Taiz have immense needs for food, medical care, water and sanitation, and shelter. The situation is very bad, but what struck me most was the strength and commitment of our Yemeni staff. Every day they come to work, despite the sniper fire and shelling. They are committed to trying to save the lives of the people of Taiz. Although the situation is bad, people are not helpless in terms of their desire to help other people — that spirit has not died in Yemen.